The WBF Online Women’s Spring Festival is being held from 9th – 15th April with a great prize given by the WBF President. The overall winner and a partner of her choice will be offered free entry to the 2018 Women’s Pairs Championship to be held in Orlando, Florida during the World Bridge Series, which starts on 21st September with the Women’s Pairs starting on Wednesday 25th September. Bed and breakfast accommodation for her and her partner is included in a double room for the duration of the Women’s Pairs event as part of the prize. 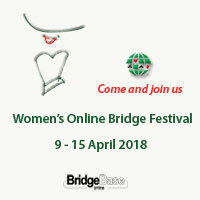 More details of the Festival can be found on the Women’s Online World Bridge Club website and full details of the event in Orlando are on the WBF Website.